A few weeks ago, I took a look at some traffic and social sharing statistics for Digg vs. Reddit after Digg launched their new version which received a lot of backlash from members of the Digg community. This week, I decided to take a peak at the numbers between Sphinn since they have released their newest platform sans voting and their newest competitor, SERPd. Please keep in mind that SERPd is a new site, still in beta mode, and has not been officially launched yet! 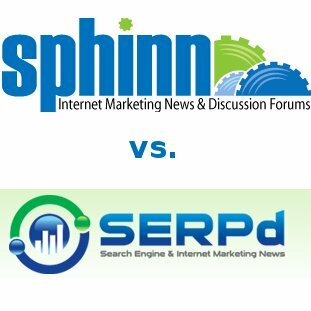 From around the time Sphinn came out with their newest version, SERPd has gained in traffic – pretty impressive for a site that hasn’t officially opened it’s doors yet! With exception to the day that Sphinn’s new version came out, the two sites’ pageviews have been trending similarly, dropping off on weekends. The bounce rate for SERPd has stayed a bit under Sphinn’s, probably due to the higher volume of new stories submitted to the site for visitors to read and interact with. Finally, the time on site is higher on SERPd, again likely due to the ability for members to be more involved through being able to submit new stories and vote upon other submissions. Since SERPd hasn’t been live for even a full month, Sphinn gets them on number of tweets for the last month. But the last day and week’s count show that SERPd’s 300+ member base enjoys sharing stories as much as Sphinn’s. Overall, SERPd is likely to continue to gain in popularity because they allow their members to have more control over their experience on the site, something noted in each review for the site so far. They can do more than just comment on and tweet submissions, or submit stories and hope that they make the one cut for new stories of the day. On SERPd, they can submit, vote, comment, tweet, and even submit the original URL of stories they like directly to StumbleUpon. It will be exciting to see how the site grows, especially once it goes out of beta mode and is officially launched. Are you a member of one or both of these communities? What are your thoughts about the changes and the response to those changes in the new site? Google+ – Is it the Future of Search?